The color coding in the plot uses green through blues to indicate times and frequencies where the Dynamic Scheduling System (DSS) will most likely schedule projects. Yellows through red are those frequencies and times when the DSS believes would be an unproductive use of the telescope. A light blue background indicates frequencies which are not yet covered by the DSS algorithms or are times for which there are no forecasted values. The blue vertical line indicates the time when this plot was last updated, usually within the last two hours. The DSS algorithms apply to forecasted opacities for Hot Springs, VA only. The plot is derived from the algorithms in DSS memo 5.3 (J. J. Condon & D. S. Balser, Dynamic Scheduling Algorithms, Metrics, and Simulations, 2007), with modifications that reflect what actually was implemented in the deployed software systems, plus the addendum for 84-90 GHz located in the Software Project Request 23Q110. Unlike the old style plot below, the affects of winds and opacities are not depicted separately. Instead, the algorithms calculate the product of efficiencies for the current atmospheric condition, for tracking errors from winds, and for the expected deformations of the dish during daytime hours. A 'typical' elevation of 30º was used in the calculation of the atmospheric efficiency. The forecasted winds used in the calculation of tracking efficiency are altered by the algorithms in DSS memo 6.2 (Dana S. Balser, Forecasting the Wind Speed in Green Bank, 2010). 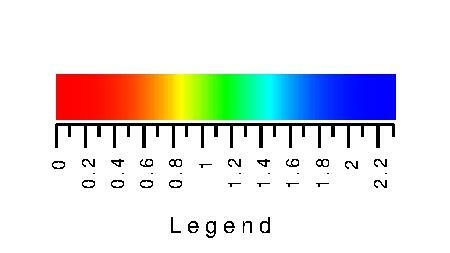 The color hue of of the plot depicts H=eta*leff/etamin, where eta is the product of the above-mentioned three efficiencies (eq. 2 in Condon & Balser, 2007), etamin is the frequency dependent minimum efficiency chosen by the DSS (eq. 23), and leff is a cutoff observing efficiency limit (eq. 24). The DSS algorithms will most likely schedule a project whenever H>1 (greens through blues). 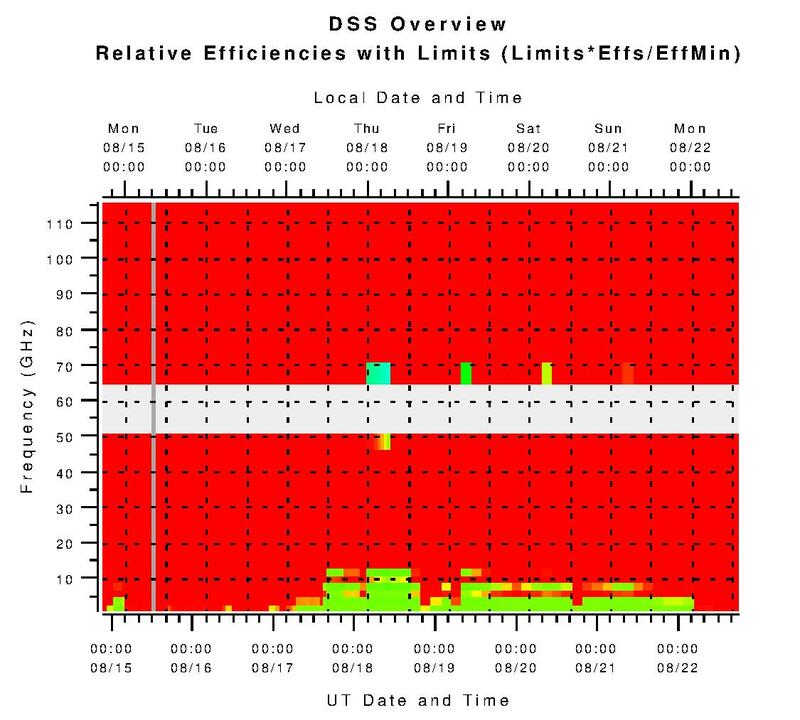 Likewise, wherever H<1 (yellows through reds), the DSS will be more reluctant to schedule a project. Since leff is a rather sharp function, you may also want to examine a graph of eta/etamin. The original version of the overview plot that uses RESTs instead of the DSS algorithms. A version of the overview plot that uses the DSS algorithms except for the observing efficiency.